90,000 B.C. - A great ice age is fast approaching. Another titanic struggle for global supremacy has unwittingly commenced between the varying animal species. Each player will assume the role of one of six major animal classes-mammal, reptile, bird, amphibian, arachnid, or insect. Each begins the game more or less in a state of natural balance in relation to one another. But that won't last: It is indeed "survival of the fittest". All of this eventually leads to the end game-the final ascent of the ice age-where the player having accumulated the most victory points will have his animal crowned the Dominant Species. The large hexagonal tiles are used throughout the game to create an ever-expanding interpretation of earth as it might have appeared a thousand centuries ago. The smaller tundra tiles will be placed atop the larger tiles-converting them into tundra in the process-as the ice age encroaches. The cylindrical action pawns (or "AP"s) drive the game. Each AP will allow a player to perform the various actions that can be taken, such as speciation, environmental change, migration, or glaciation. After being placed on the action display during the Planning Phase, an AP will trigger that particular action for the owning player during the Execution Phase. Generally, players will be trying to enhance their own animal's survivability while simultaneously trying to hinder that of their opponents'-hopefully collecting valuable victory points (or "VP"s) along the way. The various cards will aid in these efforts, giving players useful one-time abilities or an opportunity for recurring VP gains. Throughout the game, species cubes will be added to, moved about in, and removed from the tiles in play (the "earth"). Element disks will be added to and removed from both animals and earth. When the game ends, players will conduct a final scoring of each tile-after which the player controlling the animal with the highest VP total wins the game. Reimplemented by Dominant Species: The Card Game. 27 cards-1 "Survival" and 26 "Dominance"
31 large and 12 small hexagonal tiles used to create "earth"
60 wooden cylinders used for the animals' "action pawns"
120 round markers representing the earth's resources, called "elements"
The large and small hexagonal tiles will, when added to the game board's hexagonal play area, make up the "earth"- the playing surface that much of the game will be focused on. The species belonging to each animal will be placed on earth tiles from their respective gene pools. Species re- moved from earth for any reason other than Glaciation are placed back in the box, out of play-NOT back into the gene pools. The Survival Card is set aside at the beginning of the game. During play, players should keep track of how many of their species occupy tundra tiles. Any player with the sole highest count automatically and immediately takes possession of the Survival Card. If two or more players are tied for most, no player controls the card (it remains uncontrolled and will not score points for any player). 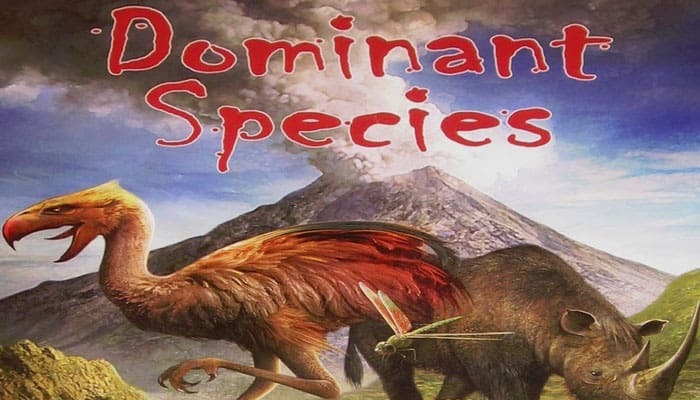 When playing Dominant Species with only 2 or 3 players, the following rules may be used which allow for each player to control multiple animals. These rules conflict with some of those found elsewhere in these rules: where there is conflict, the rules in this column take precedence. The set of wooden cylinders that players will use each turn to mark the actions they wish to perform. Mammal, reptile, bird, amphibian, arachnid or insect. One of the six animal classes that each player will be representing throughout the game. Each animal class is rep- resented on earth by a set of like-colored species cubes. Each animal has an animal display and an initiative marker.